Graduate students in the newly renovated West Penn Hall lobby. Check out more photos below. This fall, Point Park welcomed more than 270 new graduate students into the University's 17 master's degree programs, including four innovative new programs accepting their first students for the 2013-14 academic year. 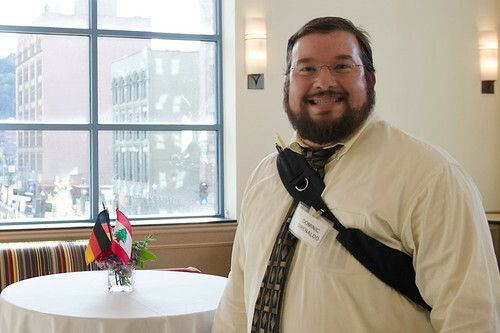 To celebrate the start of their graduate studies, master's students were invited to an opening reception to meet faculty, staff, classmates and alumni on Sept. 11 in Point Park's newly renovated West Penn Hall lobby. "You have chosen a place for higher learning that prides itself on creating a strong intersection among scholarship, practice and community," said Helen Sobehart, Ph.D., executive director of graduate education. "Graduate education prepares you to be a leader in your discipline, your community and beyond." Dimitris Kraniou, Ph.D., professor of international economics and global management and chair of the Department of Global Management and Organization, also welcomed the group. "It's always gratifying and intellectually stimulating to welcome new graduate students to the Point Park family," said Kraniou, who is also chair of the Graduate Council at Point Park. "I hope all of you have a great academic year — always strive to excel." Point Park offers graduate programs in some of today's most sought-after fields, including business, education, communication, engineering management, environmental studies and criminal justice administration. New this year are programs in clinical-community psychology, communication technology, global security and intelligence, and global management and administration. In addition, a new M.F.A. in screenwriting and playwriting is accepting students for fall 2014. Rebecca Warner, a 2013 School of Communication alumna, is excited to return to Point Park this semester as a graduate student in the new communication technology program. "Knowing what a great school Point Park is, along with the discovery of this new, dynamic program made the decision to pursue my graduate degree easy for me," Warner said. "I love the urban campus and am excited to build my portfolio to prepare me for the real world after I graduate." Stephanie Nagy, who earned a B.S. degree from Gustavus College in 1994, said Point Park faculty and administrators helped to make her transition back to the classroom smooth. "I feel confident I made the right choice to continue my education at Point Park," said Nagy, a student in the M.A. in curriculum and instruction program. "I work and live very close to Downtown Pittsburgh, so Point Park's location and the program afforded me the flexibility I needed and gave me the quality I demanded in obtaining my graduate degree." For Emily Kolek, Point Park's central location was a key factor in selecting the M.A./M.B.A. program. "Being in Downtown Pittsburgh influenced my decision to attend Point Park, especially at the graduate level, because you are close to all of the action and job opportunities in the city," Kolek said. Students will have the opportunity to network at upcoming events and seminars this academic year. In addition, master's students can join Point Park's Graduate Student Association as a way to get involved with the University's vibrant campus community. More About: Low-residency program, M.A. in clinical-community psychology, M.F.A. in Screenwriting and Playwriting, M.A. in curriculum and instruction, M.A. in global security and intelligence, M.A. in communication technology, graduate programs, M.A./M.B.A.